Coffee Machine Preparing Fresh Coffee And Pouring Into Red Cups At Restaurant, Bar Or Pub. 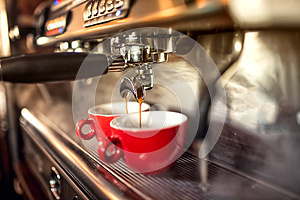 Photo title: Coffee machine preparing fresh coffee and pouring into red cups at restaurant, bar or pub. Coffee machine preparing fresh coffee and pouring into cups at restaurant, bar or pub.